You will find below the horoscope of Scarlett Johansson with her interactive chart, an excerpt of her astrological portrait and her planetary dominants. Horoscopes having the same aspect Sun conjunction Ascendant (orb 0°45'): Keanu Reeves, Heath Ledger, Freddie Mercury, Bruce Lee, Kate Winslet, Abraham Lincoln, Zooey Deschanel, Jean Dujardin, Johann Sebastian Bach, Bill Kaulitz, Andy Warhol, Alexander Skarsgard... Find all the celebrities having this aspect. Horoscopes having the same aspect Mars square Pluto (orb 1°53'): Drake (entertainer), Nicki Minaj, Oprah Winfrey, Coluche, Bruce Lee, Penélope Cruz, Muhammad Ali, Antonio Banderas, Lorde, Roman Polanski, Jean-Pierre Danel, Harvey Weinstein... Find all the celebrities having this aspect. Celebrities born the same day: Charles de Gaulle, Ville Valo, Oscar Pistorius, Mark Ruffalo, Mads Mikkelsen, Hailey Baldwin, Jamie Lee Curtis, Andrzej Zulawski, Boris Becker, Adèle Exarchopoulos, Billie Jean King, Mélanie Doutey... List of all the celebrities born on November 22. Celebrities being the same height: Kim Kardashian, Jodie Foster, Mahatma Gandhi, Natalie Portman, Amy Winehouse, Renée Zellweger, Vanessa Paradis, Mila Kunis, Kourtney Kardashian, Audrey Tautou, Monica Cruz, Carmen Electra... List of all the celebrities being 5' 3" tall. Celebrities clicked on in real-time: 577,169,800 times. Scarlett Johansson (born November 22, 1984 (birth time source: Sy Scholfield, Astrodatabank)) is an American actress. She rose to fame with her role in 1998's The Horse Whisperer and subsequently gained critical acclaim for her roles in Ghost World, Lost in Translation and Girl with a Pearl Earring, the latter two earning her Golden Globe Award nominations in 2003. She has been named the "sexiest" or "most beautiful" woman alive by several publications. Johansson was born in New York City. Her father, Karsten Johansson, is a Danish-born architect, and her paternal grandfather, Ejner Johansson, was a screenwriter and director. Her mother, Melanie Sloan, a producer, comes from a Jewish American family of Polish Jewish ancestry from the Bronx. Here are some character traits from Scarlett Johansson's birth chart. This description is far from being comprehensive but it can shed light on his/her personality, which is still interesting for professional astrologers or astrology lovers. 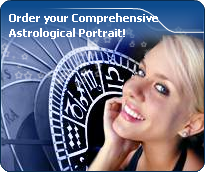 In a matter of minutes, you can get at your email address your astrological portrait (approximately 32 pages), a much more comprehensive report than this portrait of Scarlett Johansson. Scarlett Johansson, the diurnal South-eastern quadrant, consisting of the 10th, 11th and 12th houses, prevails in your chart: assertion and goals achievement are at the centre of your concerns. You are very keen to implement your dreams and your plans. You achieve your ambitions as soon as possible, whether through an active social life, highly charged friendly relations, or an urge to take actions in order to reap - in the eyes of the world, of course - the rewards of your dynamism. It is likely that spirituality or humanitarian actions are part of your motivations, sometimes at the price of some degree of isolation. Scarlett Johansson, Fire is dominant in your natal chart and endows you with intuition, energy, courage, self-confidence, and enthusiasm! You are inclined to be passionate, you assert your willpower, you move forward, and come hell or high water, you achieve your dreams and your goals. The relative weakness of this element is the difficulty to step back or a kind of boldness that may prompt you to do foolish things. The predominance of Water signs indicates high sensitivity and elevation through feelings, Scarlett Johansson. Your heart and your emotions are your driving forces, and you can't do anything on Earth if you don't feel a strong affective charge (as a matter of fact, the word "feeling" is essential in your psychology). You need to love in order to understand, and to feel in order to take action, to the detriment of a certain vulnerability against which you should learn to fight. Air is under-represented in your natal chart, with only 6.59% instead of the average 25%. Air symbolizes the values of communication, exchanges with others, but also adaptability and flexibility abilities: if you don't get out of your cocoon to talk, to show interest in others, and to socialize, you may have problems understanding others. Because of your lack of flexibility or of your refusal to adapt yourself, you may be suddenly overwhelmed by events. You should get into the habit of talking, of phoning, and of thinking in terms of "mobility, flexibility, adaptability, change" in every circumstance. It will spare you so many troubles! The Mutable mode is the most emphasized one in your natal chart, Scarlett Johansson, which indicates a mobile character that is curious and thirsty for new experiences and evolution. You are lively and flexible, and you like to react quickly to solicitations, but don't confuse mobility with agitation, since this is the danger with this configuration - and with you, stagnation is out of the question. Security doesn't matter as long as you are not bored. You optimize, you change things, you change yourself... all this in a speedy way. Your angular houses, namely, the 1st, 4th, 7th and 10th houses, are very emphasized in your chart, Scarlett Johansson: according to the Tradition, they are the strongest and most dynamic houses. Should the rest of your chart concur, angular houses suggest that you are an enterprising, energetic and assertive woman. Indeed, angular houses are said to generate impulsions and to give a powerful and domineering personality. After this paragraph about dominant planets, of Scarlett Johansson, here are the character traits that you must read more carefully than the previous texts since they are very specific: the texts about dominant planets only give background information about the personality and remain quite general: they emphasize or, on the contrary, mitigate different particularities or facets of a personality. A human being is a complex whole and only bodies of texts can attempt to successfully figure out all the finer points. Your thirst for learning is considerable, Scarlett Johansson, and you can spend a lifetime studying languages, geography, philosophy and law, particularly. You are open-minded and you want to abolish all kinds of frontiers. The humanist, who is dormant in you, may turn into a “frequent traveller” reaching out to others in order to understand them and communicate with them. You express your opinions and your beliefs with honesty and clarity and likewise, you receive others' views with enthusiasm. You have numerous centres of interest and you may be perceived to be superficial, heedless and over-optimistic. However, if you manage to control your tendency to scattering, all your encounters, all your discoveries can positively influence your philosophical life approach. Scarlett Johansson, it is obvious that you do not easily fall in love. But when you do, your feelings are deep, quiet, serious, and above all, lasting. Your need for security is indispensable for your well being and to enable you to give. You offer security and stability with your sense of duty even though you mix up responsibility and love. The charm of your partner does not only include physical features or aroused sentimental attraction, but also intellectual and moral qualities: you fiercely need authenticity and seriousness because this is the way you are. In general, your loves are not numerous and you become able to express yourself quite late in life. Your quiet and stable feelings are really worth it. If you do not get what you want, the danger is that you may seek refuge in cynicism and that you isolate yourself. The ruler of the Ascendant, Scarlett Johansson, is Jupiter. In the sign of Capricorn, it gives you the desire to broaden your knowledge and to get a long-term vision for your ambitions. Persevering and wise, you know very well what you are aiming at, even though some people may think that you are slow. What matters to you is the result, and you are convinced that time is your friend. Scarlett Johansson, the way you take action is quite paradoxical: you carry out your business perfectly well when you are in a teamwork with collective goals, but you do so in your original and individualistic manner: this is your main peculiarity. Your concern is to express your originality and your specificity while remaining immersed in a human community. You are curt and not very flexible. You are inventive and you easily fight authority, just because its very principle runs counter to the sacred values of freedom, independence and, above all, the absence of constraint. Competition does not appeal to you. You prefer to be useful and to conquer new territories of the humanitarian or the intellectual type. On the sexual plane, you are also often original and surprising regarding your fantasies and your tastes. This text is only an excerpt from of Scarlett Johansson's portrait. We hope that it will arouse your curiosity, and that it will prompt you to deepen your knowledge of astrology, as well as to visit and use the wide range of free applications at www.astrotheme.com. Your Life Path is influenced by the number 1, Scarlett, which often prompts you to have an active and sometimes original life. 1 is the number of creativity and indicates individual destinies which are achieved at the cost of personal efforts because, although the path may lead very far, it climbs steeply upwards. You need to learn to manage your life with a strong willpower while using your own resources. It is most likely that you reach the best of your possibilities if you choose a free-lance occupation, or anything which allows a lot of personal initiatives. You really need freedom of action. You prefer to innovate rather than to follow the trend, and to create rather than limiting your activities to repetitive tasks. Thus, your life may be theatre of spectacular twists and turns, all the more so because the more you progress, the more your indecisiveness fades away. In such conditions, it is necessary that you strive to maintain a minimal degree of stability in the course of your life.